In the picture above, north is at the top and the image covers 32.3 x 40.4 degrees. Image centre is located at 05:47:24.2, -23:46:48 (H:M:S, D:M:S, J2000) Astrometric data from Astrometry.net. Columba (originally Columba Noachi, Noah's dove) is seen here low on the horizon and easily found between Sirius and Canopus -- if you live in the southern hemisphere. It is one of the smaller and less obvious constellations, with an area of 270 square degrees. 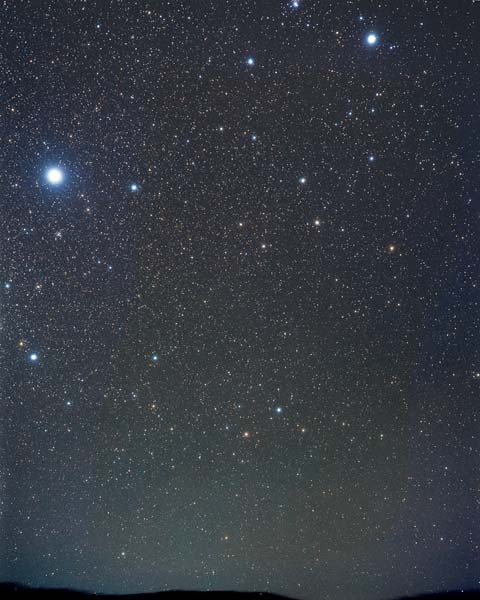 Lepus (the Hare) is about the same size as Columba and rather more obvious to the eye, lying to the south of Orion. It is one of Ptolemy's 48 constellations preserved to this day. More information, and an alternative image of Lepus is here. Al Kurud (κ Col), Arneb (α Lep), Ghusn al Zaitun (δ Col), Nihal (β Lep), Phact (α Col), Wazn (β Col). Constellations adjoining Columba: Caelum, Canis Major, Lepus, Pictor, Puppis.